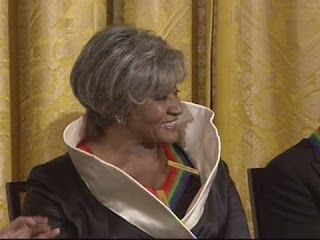 Some months back, we reported here that Ms. Grace Bumbry was to be among those being recognized at this year's Kennedy Center Honors. Ms. Bumbry is part of that generation of singers that helped break down barriers placed against African Americans. As you probably read in my previous post, she was cast by Wieland Wagner (Richard Wagner's grandson) as Venus at the Bayreuth Festival in 1961, at age 24 - the first black singer to appear there. Conservative Germans were appalled, and the ensuing media attention shot her to international fame. She was subsequently invited by Jacqueline Kennedy to sing at the White House. She returned to Washington DC in 1981 to sing at the Inauguration of Ronald Reagan. Ms. Bumbry has returned to the White House once again. This time, she was honored by the president, who himself has broken a few barriers in his day. On December 10, 2009, President Obama met with and celebrated this year’s Kennedy Center Honorees - Dave Brubeck, Mel Brooks, Grace Bumbry, Robert DeNiro, and Bruce Springsteen. Below is some footage from the event courtesy of WhiteHouse.gov. Enjoy! And, don't miss The Kennedy Center Honors, which airs at 9:00 PM on Tuesday, Dec. 29th on CBS.